For the last session of this ‘Inspiring Stories ’project , we first divided the whole class into groups, then let each group choose a British children's work. According to the content of the works, we encourage students to start imagination, then create stories and then write down the scripts. At last, the children shoot the script into audio or video works with the help of teachers or parents during the spare time. The event was a new experience for the children, and they were excited and happy. 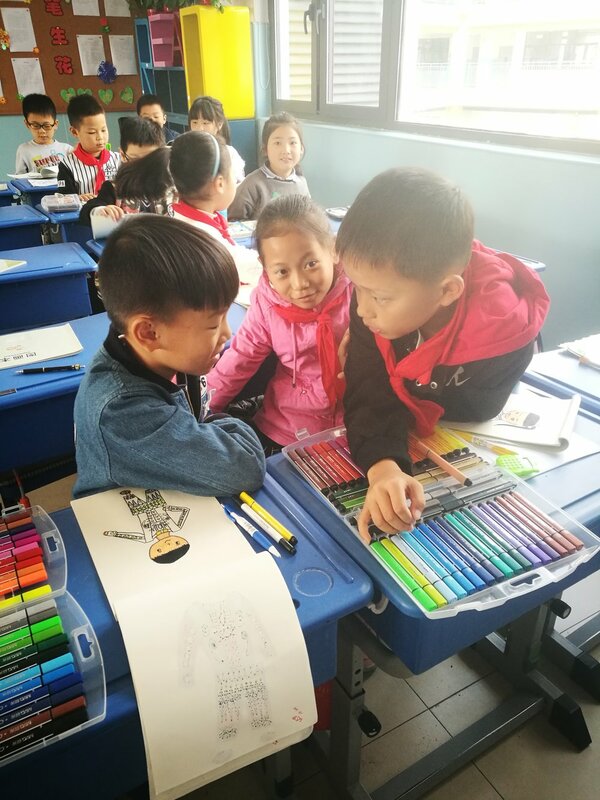 The artists in Grade 3 (9-10 years old) at Taizhou Pheonix Primary School in Jiangsu, China are making and sharing art with the artists in Class 4 (8-9 years old) at Sneinton C of E St Stephens Primary School in Nottingham, England Both groups are aged 8-9 years old. We had the most fun doing this project! The class really enjoyed looking at all of the images sent by the children in Jiangsu, China. They all chose different images as inspiration for their stories, working in pairs they told their stories to Heather, even making their own sound effects. Heather then chopped up their stories and put them together to make ‘their story’ and played it to them after they had just performed their Christmas play. They laughed a lot and enjoyed hearing their own voices! I noticed that many of the stories encompassed the ideas embedded within the project…asking questions, making friends and reaching out to others. I would like to get the children to draw this story now and create a montage with the original images. It was a perfect end to a fantastic project and I am sure that it is an experience that they will always remember. I have really enjoyed getting to know the children and going on this journey with them and you all! See you in 2018! 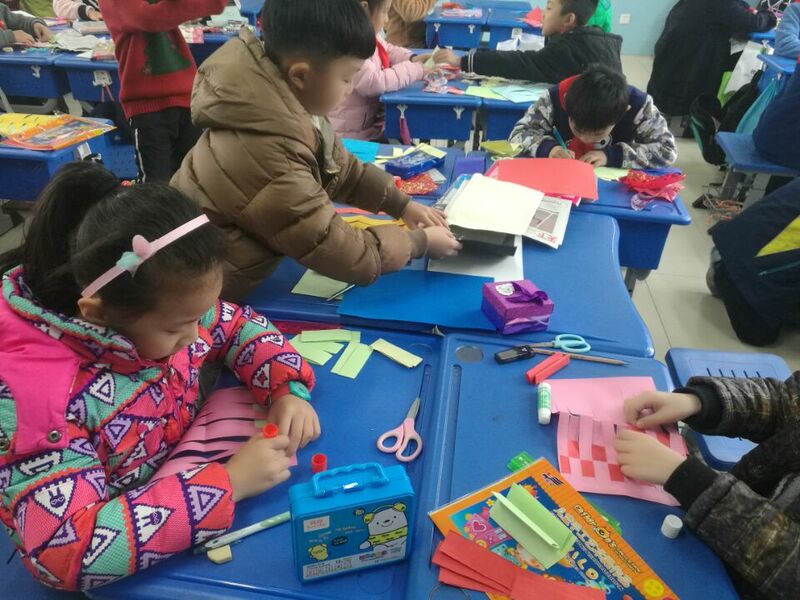 The artists in Class 4 (8-9 year olds) at Sneinton C of E St Stephens Primary School in Nottingham, England are making and sharing art with Grade 3 (9-10 year olds) at Taizhou Pheonix Primary School in Jiangsu, China. 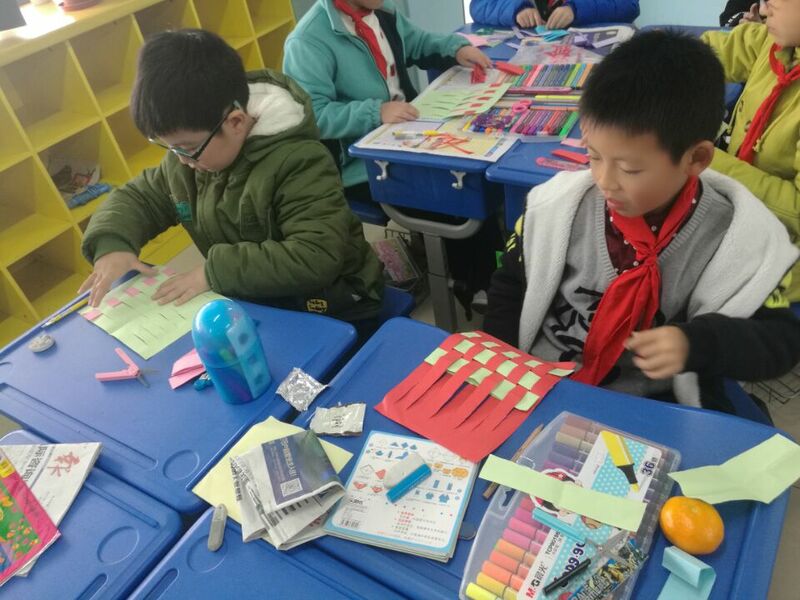 The friends in China and the UK are "Hand in Hand"
In this activity, the teacher first talked about the form of weaving. Then the teacher presented some pictures of weaving artworks, which made children understand it well. Next, teachers and children had a discussion on how to do weaving artworks. Children said there were two pieces of paper that were horizontal and vertical. They could be weaved with one press and one pick. 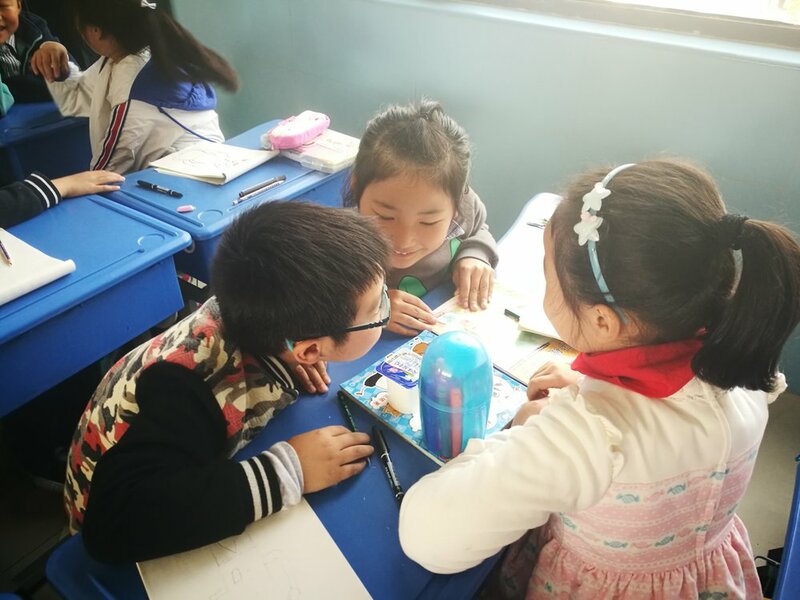 The art teacher Miss Liu Chunjuan and her students demonstrated at the front of the classroom, and students worked in groups to make it out. Finally, the teacher encouraged the children to give a name of the book. Some students said, we want to express our friendship between the two schools, so he took the name of ‘ Hand in Hand’. Year 4 have had another fantastic art project with Heather on Friday. The children started off by discussing the artistic journey they have been on so far and the relationship they are creating with the children in China. Lots of pupils suggested titles for their work which revolved around the idea of a team identity, and the title we have decided upon is 'This is us'. As a class, we felt this showed how all of our art work is a representation of our characteristics, personalities, likes, dislikes and artistic talent. After having chosen the project's title, we then had a fantastic session with Heather where the children created a book cover using weaving. 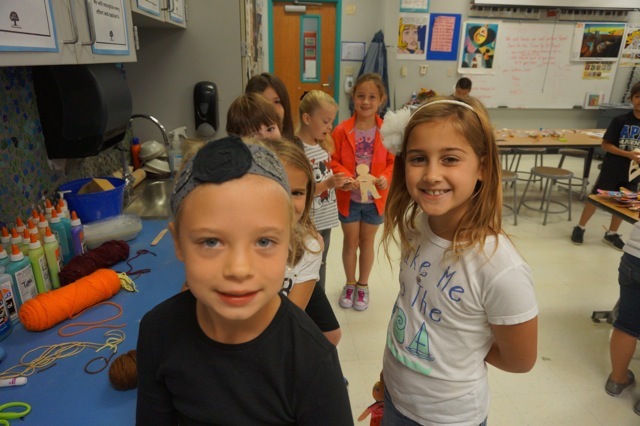 We used all recycled material, and some children even used practice pages from previous Dear You art projects to incorporate within their weaving. I hope you will agree that the woven book covers they have produced are excellent! They have all used lots of different colours and types of papers. We are all looking forward to creating the next piece of artwork! What I noticed about this session was that the pupils really started to think for themselves and to make connections with the other projects they had done, they had really enjoyed receiving and looking at the work that their partner class had sent and integrated some of their ideas into their weaving, introducing hidden flaps for their title – so the dialogue becomes evident in the art works they are producing. The children said that they used the visual clues in the work that they received to imagine the questions they had asked when they couldn’t read the Chinese text, I wonder whether they would have done this had they not answered the same brief. I am also impressed with how thoughtful the children are and concerned with how they can communicate their ideas to those in China. Exploring and making with the artists in China! In order to understand the foreign pen pals well, the headteacher Miss Diao Yangyang led the students to visit the website of Sneinton C of E Primary School before doing the second project. They also visited the website of Dear You for the first time art works and creative process of the British children. The children are very excited when they read the news. They had a lot of questions to ask their foreign friends, such as: What do they learn at school? How to have classes? Do they have homework? What do they usually eat for lunch? What animals are in their city? After that, the children began to discuss in groups, thinking how to express their questions in art form. Some children thought to make greeting cards, hiding the question paper in them; some wanted to write down the questions with brush pens; some wanted to use the form of the combination of paper-cut and painting ; some chose to write the questions on the origami etc. After discussing and defining their own artistic expression, the children came home and turned their problems into a piece of art with appropriate materials. Friendship grows between the artists in UK and China! The children at Sneinton Church of England Primary School have once again had a fantastic time completing their next piece of artwork for the Dear You Art Project. It all started with great excitement by opening the envelope containing artwork from our partner school. The children were fascinated by the self portraits, as well as the questions they had sent in Chinese writing. All of the pupils commented on how beautiful this writing was, and how it was like an art form in itself, which led perfectly onto the next project, where the focus was font and text. To simulate discussion about different fonts and text types, we used a powerpoint created by Heather to discuss the varying fonts we have in our classroom and how each of them made me feel. It was very interesting to hear the children's views on how one font may suggest somebody was scared, and another one may imply that somebody is very serious and possibly earns lots of money! They were fascinated by how a font can tell you so much about the artist and their message! As a class, we then talked about how we use questions in everyday life to find out information about people's lives and interests. Each child came up with a question to ask their partner student, and then thought about how they were going to present it. We talked about using different sized letters, stencils, different textures, as well as a variety of fonts. We then created a piece of artwork by drawing the questions using lots of different fonts! 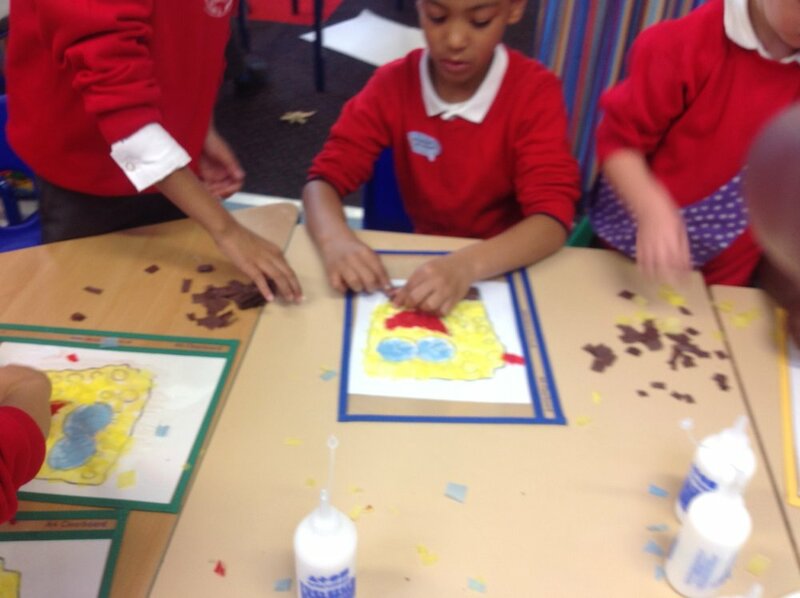 The children were concentrating so well and they really enjoyed trying a new art form. We hope you enjoy our artwork! Our first mail art exchange! 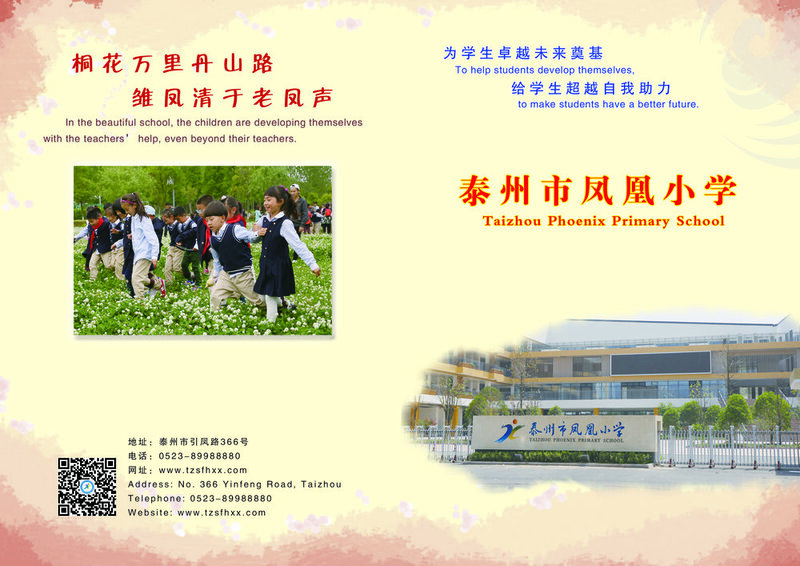 We are from Taizhou Phoenix Primary School of Jiangsu, China. We are the children of Class 3 Grade 3 who are aged from 9 to 10. We just start to learn English recently, so we can not write well in English. But we can express ourselves by drawing or doing art works. You can guess how I look like and how I feel by our pictures. On Sept. 26, the art teacher Miss Liu Chunjuan took us to the art room. Firstly, She drew a big body on the blackboard and let us discuss what makes humans unique to each other. For example, the DNA, the fingerprints, personalities etc. The children shared ideas and wrote many key words on it. Secondly, she asked us to draw a self-portrait . We took many pictures about them. Thirdly, Miss Liu showed us how to cover the parer with graphite, and we tried. Wow! The paper turned dark soon and so did our hands. Everybody was happy! Then, we took another different colour of paper to make a transfer drawing. Some of the kids used fingers , some used feet, some used hands, some used arms. All of us laughed happily. At last, we wrote ours name on them to let foreign friends know who I am. 1. I won’t forget this drawing lesson one hundred years later. 2. It is the first time for me to make pictures with fingers. That looks great! 3. I want to try again to make it more clearly. 4. I know that everybody is unique . 1. The children enjoyed the process of doing the art work. They are eager to be my little teacher to help classmates to finish. They become more helpful. 2. The open question ‘what is unique?’ expand the children’s thinking . Everybody learns to share. 3. We are eager to see the art works from the UK. Exchanging ideas makes human get close. Thank Dear You for linking us together! Heather Connelly, local artist to Nottingham and Dear You workshop leader, introduces to Class 4 where there new friends abroad live. In China! Class 4 had a fantastic art workshop thinking all about the topic of what makes them unique and how we are all different. After having completed some homework beforehand about their families, appearance, DNA, likes and dislikes, travel and heritage, the children were ready to explore their ideas in art. Heather showed us some fantastic images of how celebrated artists have created pieces focused on the differences in the human body and the idea of a map to represent uniqueness. The children then discussed how they were all different and how this diversity can be represented in artwork. The children loved comparing their fingerprints, as well as talking about their different heritages and how this influences their daily lives. After discussing the ways in which uniqueness and the idea of 'self' could be represented in art, the children then started practising their own ideas. Many children created a pencil drawing of the lines of their hands and their fingerprint. The patterns created on paper were brilliant! One of the children commented, "My fingerprint is completely different from my friend's. That means I'm unique. That's pretty amazing!" I hope it is clear that this uniqueness is expressed in the children's fantastic artwork. During this practice stage, many children were fascinated with how lines and simple patterns could be so effective in artwork. They soon realised that art is not a perfect picture with recognisable objects; it could instead be a representation of themselves through basic lines, swirls and strokes of their pencils. The children then used carbon paper to transfer their drawings, which created an interesting texture on the paper. Some pupils loved using the carbon ink to create more texture, which represented their own characteristics! Having looked at all of the pieces of artwork, I think it is apparent that Class 4 are a very talented and unique group of children! No piece of artwork is the same, and the little slips of paper tell the story of the artistic process for each child. We are all very excited to receive the artwork from our partner school and to complete our next piece of art! The pop up house was interesting! We hadn't done anything like this before so we had practice at cutting scrap paper first. The children were very excited to represent their lives through a room in their house and tried hard to find things from a catalogue that looked like their furniture. They like making their room come to life and it sparked a conversation about different kinds of beds! The 5 and 6 year old artists in Class 1 at Sneinton C of E Primary School in Nottingham, England are making and sharing art with the 4 to 6 years olds in KG2B at Collegiate American School in Dubai, United Arab Emirates. How many sounds are there?!?! The children were surprised at how many different sounds there were! Some children said our world is very noisy and that wouldn't it be sad if we couldn't hear. We wondered if our friends in United Arab Emirates would hear the same sounds. Making, sharing, and then talking on the phone with our friends about it! Kids were really excited about this project, they kept thinking about places were their characters could live and almost everybody came up with more than one idea, and so, they asked for the opportunity to make 2 or even 3 projects. Andres said that his character lived in disney because it was the happiest place in the world. Renata said that her character could live in the beach because he loved to swim in the ocean. Anabella and Sofía Ayala came up with a make-believe land were their character could live, because after all, characters should be able to live anywhere we can imagine! This was by far the most enjoyable project for my kids and I was delighted to see them so excited creating beautiful pieces for our friends in Nottingham! The day finally came when we were going to meet our art pals! Kids came really early to school so we could make the time difference work for everybody. We had a computer ready to make the facetime call but for some reason the connection was not being successful. So, us teachers exchanged our phone numbers and used our mobile phones to make it happen. My students' faces were priceless when they saw their friends live! They sand and danced for them, and they watched their friends do the same for them! They exchanged questions and got to know some differences about our schools. I have to admit they were kind of jealous because in Nottingham they get 3 breaks and they only get 1! We got to sing happy birthday to a beautiful girl who happened to have a birthday that day!! They asked questions about what was the time, how was the weather, how they get to school, what do they eat for lunch, etc. For the rest of the day they kept talking about this amazing experience, and can't wait for us to have another global session! I can't thank you enough Arlene and Nina, for making this happen!! The 5 and 6 year olds in Prepri C from Colegio San Patricio in Monterrey, Mexico are making and sharing with the 5 and 6 year olds in Class 1 from Sneinton C of E Primary School in Nottingham, UK. We looked at pics on the internet of under the sea. The children were keen on making a list of all the animals that live under the sea. I like colouring it's fun because when you have finished you can play with it. The 5 and 6 year olds in Class 1 from Sneinton C of E Primary School in Nottingham, UK are making and sharing art with the 5 and 6 year olds in Prepri C from Colegio San Patricio in Monterrey, Mexico. Dear You at InDialogue Symposium December 1 & 2, 2016! Guest Speakers: Dom Breadmore, Elena Cologni, Luigi Galimberti, Saskia Holmkvist, Bo Olawoye, Helen Varley Jamieson and Rachelle Viader Knowles, and Katherine Wimpenny. Performers: InDialogue resident artists Chloé Déchery and Jane McKernan, Sally Doughty, Rachel Krische and Lisa Kendall, Vida Midgelow and Jane Bacon, and Michael Pinchbeck. Supported by: Nottingham Contemporary, New Art Exchange, Dance4, Nottingham City Council and Birmingham City University. Dear You's interactive presentation is supported by Taiteen edistämiskeskus (Taike). To register for the event, click here. Image credit: Monika Jaeckel: The Touching Moment: Touch as dialogical form – the matter(ing) of response(ability) or being constituted by getting in touch. Integrated paper and performers Katherine Hall, Jack A. G.Britton and Lewis Holt. InDialogue 2014, Nottingham Contemporary. Photograph by Amy Payton Edwards. This project went really well and it was a perfect for our curriculum since we were learning about how to describe our own homes. So we took this opportunity to make a drawing and a little message describing their homes to our friends abroad. They were really excited about letting everybody know how their houses looked. Also, when we covered the drawings with the black paint they got kind of nervous because they thought it was ruined. But then, when they draw the outside of their homes on top of the black paint their faces were priceless!! They were amazed to see that if they scratched the black paint, our friends in Nottingham could be able to see the inside of their homes!! Sneighnten CofE's Layers of Love! I liked scraping all the black off...it was like magic! The colours look like he is under the sea, it looks amazing. just like he is under the sea! The children love love loved this project!! The children worked in pairs for this project. They really enjoyed the stickiness and the thought that the Mexican children would actually receive this art. They love the SpongeBob films and noticed how he is a happy character and that yellow is a happy colour, like the sun. Doing him with tissue paper they thought was like his sponge body and using the transparent plastic was like under the water!!! Artist Trading Cards (ATC) are a win! 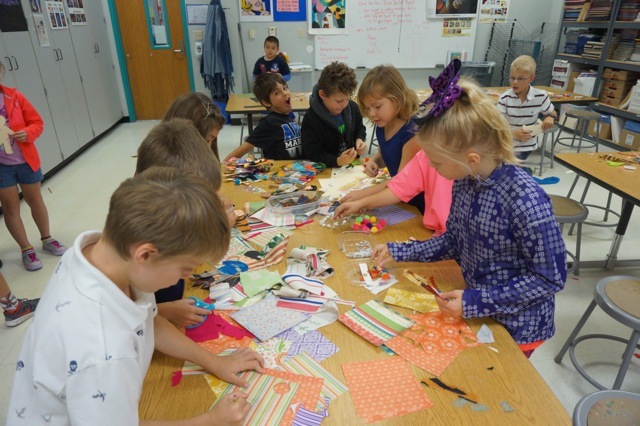 Kathleen Finan, the art teacher at Amy Parks Heath Elementary School in Heath, Texas has been making Artist Trading Cards (ATC) with her artists. They have just sent these to their Dear You friends in Nottingham, UK! Kathleen wrote, "The students wrote holiday greetings on the back of these ATC scratchboards. I bought these glitter scratchboards for the holidays, sometimes I make them with the kids. The candy bags had 3 ATCs in them telling their favorite holidays when candy is given." What a treat! Not only did the artists make Candy Bags for the October project, but also ATCs! From Texas to England, here we go! Kathleen Finan and her 2nd graders at Amy Parks Heath Elementary School in Heath, Texas are ready to snail mail their first exchange of Dear You artworks to their new friends at Sneinton St Stephen's C of E Primary School in Nottingham, UK. Their Self Portrait Puppets are full of personality!